In the inventory pane, right-click the Backup Repositories node and select Add Backup Repository. Alternatively, you can click Add Repository on the ribbon. 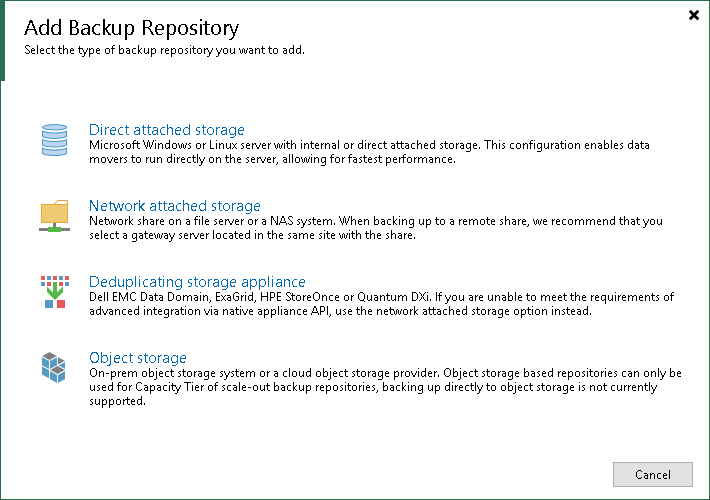 In the Add Backup Repository window, select the type of the backup repository you want to add. The New Backup Repository wizard will guide you through steps for adding direct attached storage, network attached storage, and deduplicating storage appliances as backup repositories. For information on how to add object storage repositories, see Adding Object Storage Repositories.